The attacker threatened to set a woman on fire after taking her hostage in Germany in what police say could be a foiled terrorist attack. 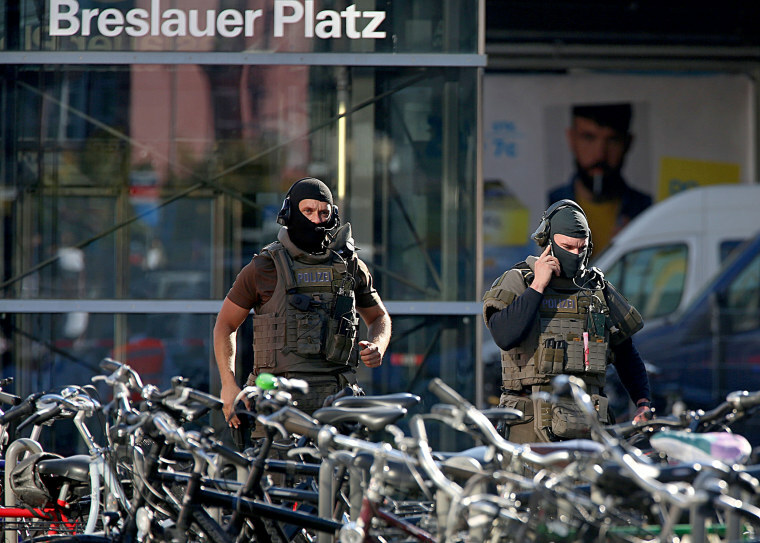 MAINZ, Germany — A teenage girl was injured and a woman was taken hostage on Monday at a train station in Germany in what police say may have been a foiled terrorist attack. Investigators said the incident began just before 6:45 a.m. ET when a man carrying several Molotov cocktails entered a McDonald's near Cologne's main train station and ignited one, which injured a 14-year-old girl. The attacker then fled to a pharmacy at Breslauer Platz, near the back side of the train station, taking a woman hostage, police said at a press conference. He "massively threatened" the hostage, police said, and at one point tried to set her on fire. Authorities said they believe the hostage taker had a weapon and fired multiple shots at him when they stormed the pharmacy around 9 a.m. ET, taking him down. He was seriously injured during his arrest and transported to the hospital for surgery, according to the Agence France-Presse. His current condition remains unclear. The woman held hostage was treated for minor injuries, police said earlier Monday. An eyewitness told local media outlets that the 14-year-old was screaming and "running for her life" with flames shooting up her legs, AFP reports. It was not clear what condition the teenager is in. Police originally said there was "no indication" the hostage situation was terror related, but said during the press conference they were investigating "all directions" and could not exclude it may have been an attempt to carry out a terror attack. According to police, several eyewitnesses said the attacker allegedly claimed to belong the Islamic State of Iraq and the Levant. Investigators said a suitcase and a bag believed to belong to the attacker were found at McDonald's. Several Molotov cocktails were also found at the scene, along with an ID belonging to a 55-year-old Syrian asylum seeker. The prosecutor's office said it is "likely" the ID belongs to the hostage taker, but they are not 100 percent sure. Police said they found that the name on the ID was linked to a number of different crimes since 2016.